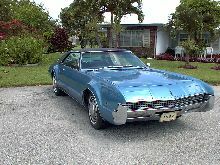 In 1974 the Toronado only had one choice of motor but what a motor! The V-8 with a capacity of 7,446 cc output power of 253 DIN bhp to the front wheels. A new era was begun with the Toronado. For the first time since the Cord of the 1930's a big American car had front-wheel drive. 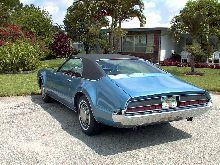 The Toronado had everything the American buyer could want in a sporting car. It was a coupe with an endless motor hood or bonnet.